Every event or occasion brings many people who expect some guidance when parking, and maneuvering through traffic around the venue. Once inside, these guests have expectations of safety and orderly behavior, so that they can enjoy the experience without worry. Quality event security staff ensure that your guests are secure and protected, while making sure that the flow of traffic and people maintain a safe pace. If a problem arises at an event, your security guards should also be able to de-escalate potentially harmful situations, and respond to an incident in a manner that is appropriate to the challenge or threat. Because we maintain a large pool of fully vetted security professionals required to meet stringent qualifications, we work with you to fully develop your entire event staff. In fact, we will customize a plan to your needs, no matter the size , time, or length of your event. One of our primary goals at Echelon is to become a true security partner. If you work as an event planner, it’s likely you stage events in vastly different venues with varying crowd sizes. Depending on the location of the venue, your traffic and parking management requirements also require specialized approaches to maintain the flow of traffic and avoid costly setbacks. As an event planner, you depend on a reliable and flexible security company who can supply you with the right quantity of traffic management and crowd control professionals depending on the nature of each individual event. At Echelon Protection & Surveillance, you can hire security support for a single day occasion, a multi-day event, or keep them on staff indefinitely. We work closely with you to coordinate all detectives and guards in order to maximize efficiency and your budget. If you suddenly need additional security officers for parking, traffic, or crowd management needs, we can supply them to you at a moment’s notice. In this way, we become your trusted security partner, working to implement safety protocols that align with your event needs while keeping the flow of traffic and people moving safely and smoothly. Qualified event security guards are experienced professionals capable of anticipating issues and trained to handle unforeseen challenges when they arise. Our security agents are vigilant, reliable problem-solvers who are trained to work with the public. Traffic and Parking Management – Effective traffic control starts by effectively analyzing the situation and developing a plan that coordinates personnel in key areas where traffic backups are most likely to occur. It is also of vital importance to ensure the safety of drivers and pedestrians while maintaining the flow of traffic in and out of the event. Our traffic management specialists have extensive professional training and experience. We also provide them with all of the tools and equipment they need to effectively manage traffic as a team, including radios, flashlights, yellow lights, traffic cones, signage, reflective vests, and highly-visible uniforms. Required certification in emergency response, CPR, and evacuation coordination means they can handle any problem effectively. Parking management falls under the same umbrella as traffic management, as effective communication with drivers ensures that vehicles flow smoothly into and out of parking areas. Our security officers are not only trained to manage the ebb and flow of traffic around parking areas, but can handle any equipment necessary to get the job done. We can also supply them with the tools they need to be effective parking managers including radios, uniforms, and call phones. Crowd Control – Members of your security event staff will be responsible for different duties, but it’s important that they act as a unified team and communicate clearly throughout the event. Not only must people be able to move in and out of the venue freely, but their safety while at the event must be ensured to decrease liability and risk. Your event security staff dedicated to crowd control may be separated into separate units handling specific tasks. Effective crowd control requires experienced security officers capable of maintaining the flow of people in and out of the venue, while offering guests confidence that they are safe while inside. 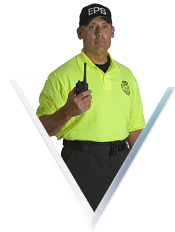 Our security guards can also manage aggressive behavior, respond intelligently to confrontations, calmly deal with emergencies, and de-escalate potentially harmful situations. By acting as a goodwill builder and concierge capable of assisting and directing guests, your guards will promote your brand and bolster your image. From parking management to crowd control, your event guests are in good hands when you work with the professionals at Echelon. We can work together to customize a security plan that meets your requirements and budgetary demands – simply contact us for a free consultation so that we can prepare a strategic plan and cost estimate.